Leaves, leaves everywhere (and still falling)! This spiral of leaves took a little while to make but my kids really enjoyed helping construct it. In fact, when I ran out of steam they continued to enlarge it by adding more leaves themselves. Great outdoor activity for the fall if you have the time! My husband noticed this big bug on our downspout while grilling supper last week. This was the first time either of us had seen praying mantis in person. What an exciting find! Of course, the kids and a couple of neighbor friends had to take a peek as well. Upon closer inspection we noticed the mantis was injured. The end feeler portion of one of the middle legs was missing. Pictures like that make me wish we had leaves that fell in abundance. The thought of raking it all makes me glad we don't. What a creative way to play in the leaves! We only pile them up and jump in them-lol! 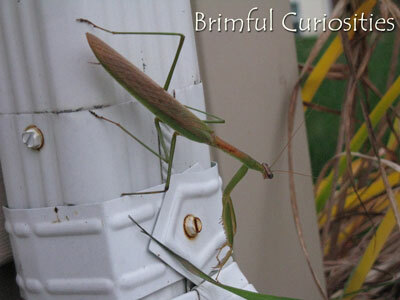 I saw a Praying Mantis this year too! I hadn't seen one since I was a kid. That is a cool maze. I bet they had fun with it. I never saw a praying mantis when we lived in Wisconsin but they were all over the place in California. Cool photos! Your leaf maze looks awesome! Praying mantises are cool! 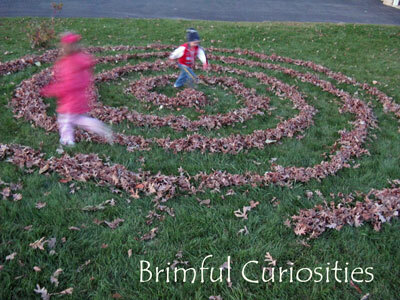 Making the spiral of leaves had to be relaxing and fun for all of you. The maze looks like so much fun! Totally worth the time and effort. I love the leaf maze! I've never thought about doing one.